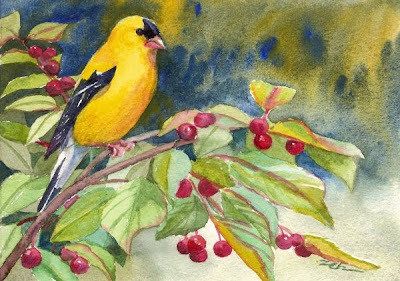 The crabapple tree is loaded with fruit and this goldfinch stops to rest on a branch. I love seeing the bright yellow flash of these birds as they zip across the yard. This painting has been sold. Visit my website to see more of my art for sale: zehoriginalart.com. Thanks, and have a pleasant day! Thank you Krys, I am having fun with dropping intense color onto wet paper to let them mix. It works well for backgrounds.